An early wake-up call for Val in order for us to start getting packed up yesterday morning interrupted what we’ve come to call my “office hours”, which generally take place between six in the morning until about eight thirty, when the girls finally wake up and have gathered the will necessary to claw their way out of the warmth of their sleeping bags. I’ll get up, clap some warmth into my hands and start fumbling around the stove as quietly as I can to boil water for a pot of coffee. While the water is on I will brush my teeth and dig the laptop out of the truck, and the milk out of the fridge. Suitably armed with clean teeth and a thermos of hot coffee, I’ll head off to a picnic table, shelter (if there is one) or comfortable rock and start writing. As I get used to this al fresco work environment, I note that I have become quite productive and quite enjoy having time to think through the prior day’s events. We’d been frustrated by weather and bad luck for two straight days in trying to spot the apparently dozens of Belugas that enjoy frolicking right beneath our noses in the Saguenay. Waking up late and, unusually for the past week or so, quite warm, I poked my nose outside to discover clear blue skies and a powerful, warm sun bearing down on us. It was luxurious, and I enjoyed this rare spot of direct, unapologetic sunlit bliss the way the English do – I flopped into a chair with a book, ignored all work, and set about burning my arms and nose. Val woke up soon thereafter, and for the first time in days, we enjoyed our lack of itinerary by lazing about in our chairs and watching the girls chase chipmunks, collect lichen in order to build nests for their dinosaur eggs (rounded, speckled granite rocks) and lock themselves into the bathroom in order to make toilet paper outfits for their dolls. As we inched toward noon, Val announced that she was antsy and wanted to do something. There was some argument as the girls had their own agenda: ice cream and then the petting zoo at the Laundromat again so we could see Azul the Moose and play with the pig. This was, frankly, tempting to me but Val wanted to set her eyes on something new so we jumped into the truck and headed to Tadoussac, the small town at the mouth of the Saguenay fjord and home to both a whale research center and museum as well as a national park mysteriously named “the dunes” which made no sense to me given that the entire landscape we had found ourselves in for the past three weeks was carved from solid granite. Off we went, to the great disappointment of Sylvie as she petulantly noted she had neither an ice cream nor a moose in her future. All of the driving, thanks to the particular geography of the Canadian Shield, has been spectacular so to say that the drive into Tadoussac was extraordinary is probably going to sound tedious at this point, but it was gorgeous. We drove slowly into town, found the ferry port, and then followed signs pointing us to the direction of the dunes. 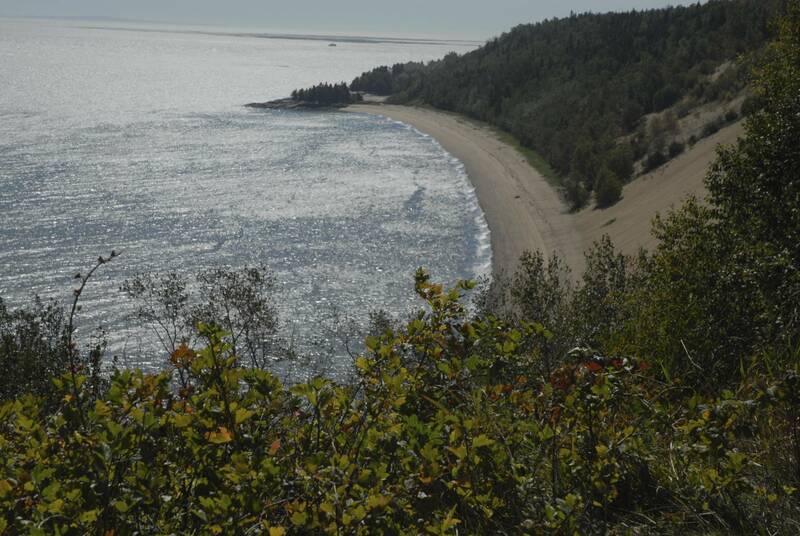 Within a handful of kilometers we found ourselves standing at the top of an enormous sand dune, rising almost straight up hundreds of feet from the shore of a crescent shaped beach and, given the sun and clear skies, an incredible view of the St. Lawrence, all the way across to the south shore. 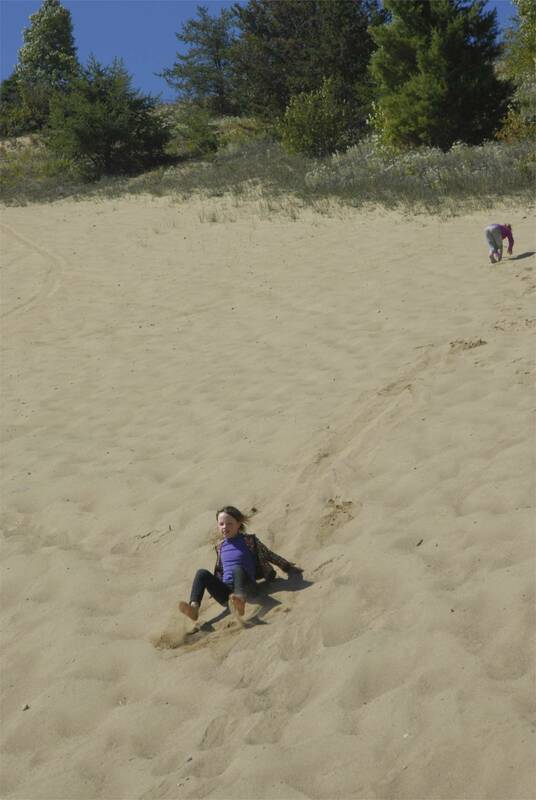 The girls immediately wanted to throw themselves down the dune but we vetoed that idea, because it was truly immense (I’ll have to get the information later, but we’re talking hundreds of feet) and truly steep (we’ll see if the pictures do this justice but I think 45 degrees is maybe underselling this thing). We took a path to an information building which was, frustratingly, closed and further, had no trail maps posted outside. I suppose at this point in the season you take what you can get. So we simply guessed on a path that might take us down to the beach, shouldered a bag with fixings for lunch, and started marching down a very steep trail through a lovely mixed forest of predominantly birch. 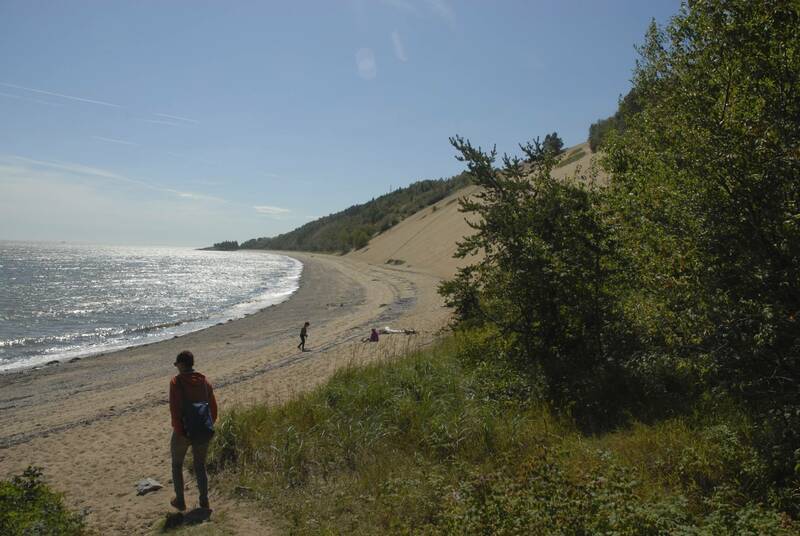 We were suddenly spit onto the beach, which was even bigger than we had been able to see, a gorgeous little crescent of sand maybe half a mile long and anchored at either end by huge, smooth, granite outcroppings. 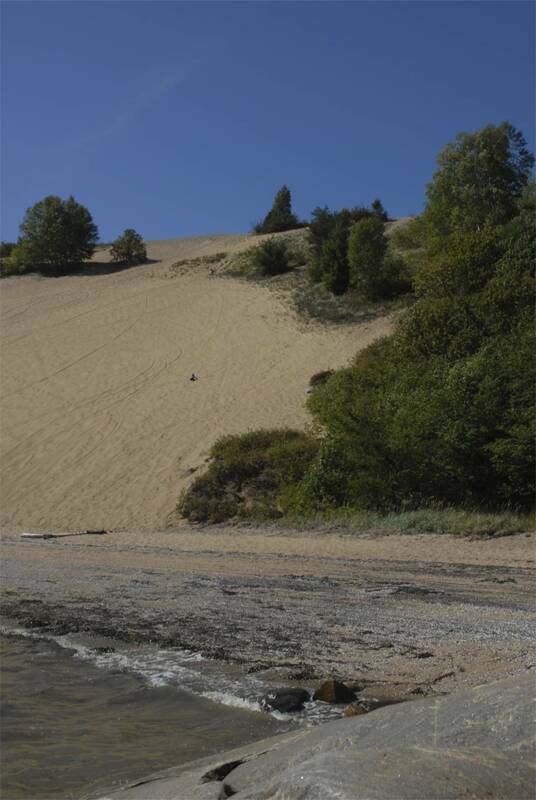 The dune rose abruptly from the sand at some impossible angle, and the girls literally couldn’t stop themselves and started climbing. They made it two thirds of the way up, high enough that Val and I were using binoculars at this point to try to keep track of what they were doing, and they were clearly having so much fun (they found a smallish bluff with some grass and a tree on it and were, apparently, nesting) that we simply flopped into a perfectly shaped curve in the granite at the east end of the beach, made a couple of sandwiches, and took a long, lazy sun bath. 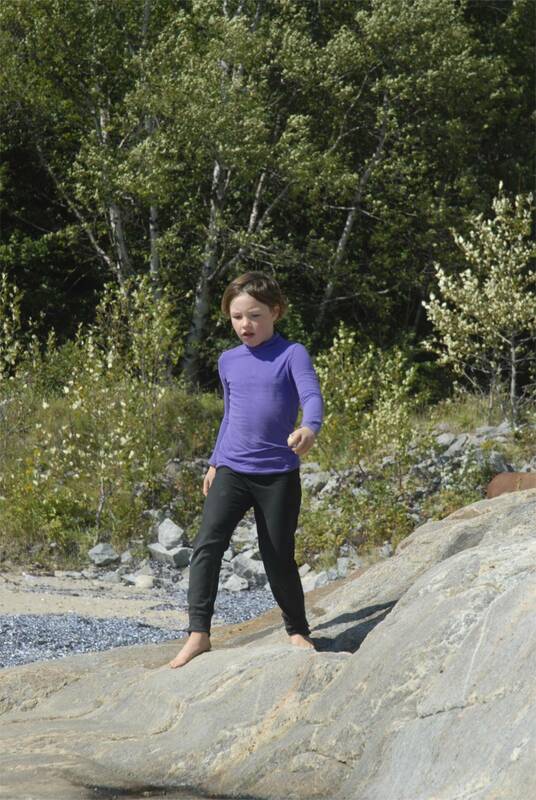 With the waters of the St. Lawrence lapping at the rock and pushing empty mussel shells up onto the beach where they will ultimately make purplish sand, and with the sun warming the rock and forcing me to keep my eyes closed, and making my back warm while the breeze kept my chest cool, and the girls climbing dunes and working their way so far from us that they are simply dots on the horizon, I thought: so this is what we do now, with our life, and it doesn’t seem like such a terrible decision. Leonie came down the dune and demanded lunch, which we made for her, and put into a bag so she could carry it back up to Sylvie. We stayed on that rock, talking to each other about what to do with the day, the week, and the rest of our lives and it was warm and enjoyable, but no conclusions were reached. 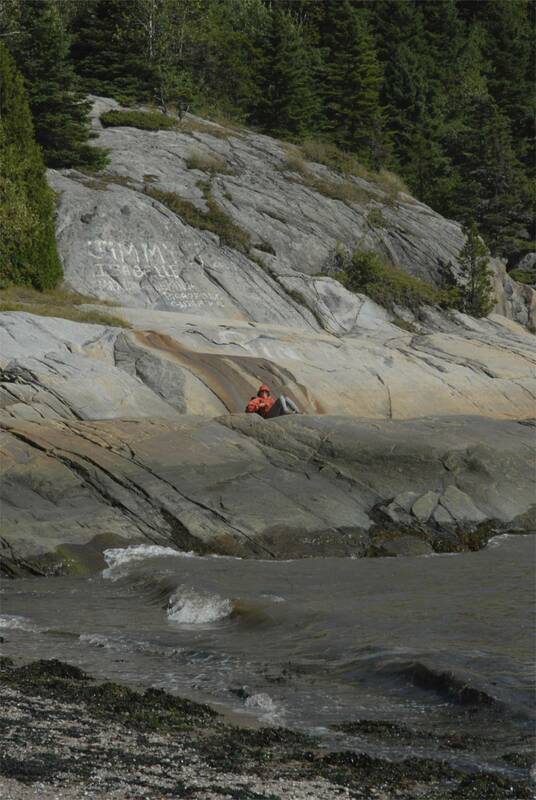 The tide forced our hand, and the St. Lawrence inched its way up our granite sofa until it began to threaten our toes. 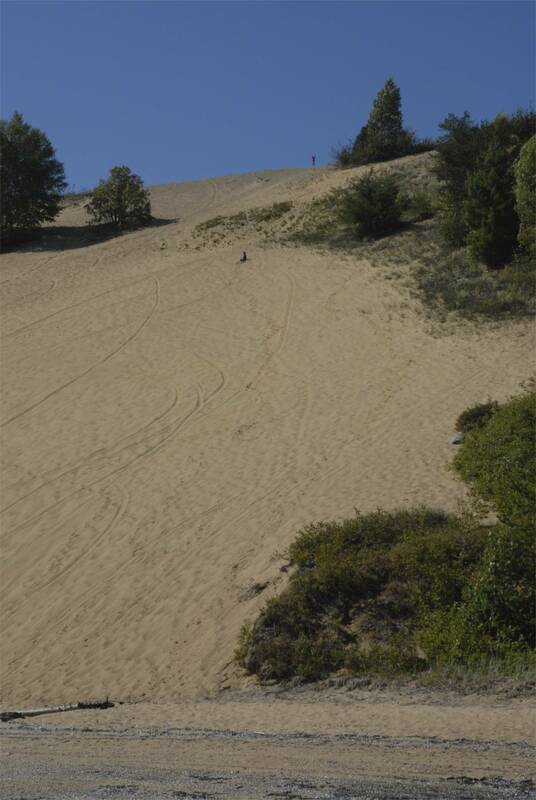 We guessed that the truck was parked more or less near the crest of the dune where the girls were, and so it would be easier to climb to them and keep going to the top than convincing them to come down, only to have to climb the trail again. So up we went, and it was tough going. 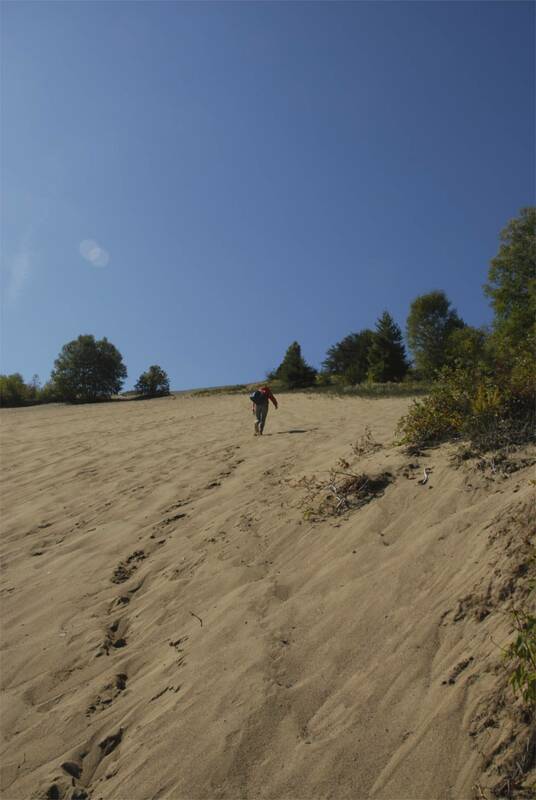 The dune was every bit as steep and tall as it looked, and moving up the thing took a shocking amount of effort, especially to bodies that had been lulled into tranquility by the morning’s relatively undemanding activities. 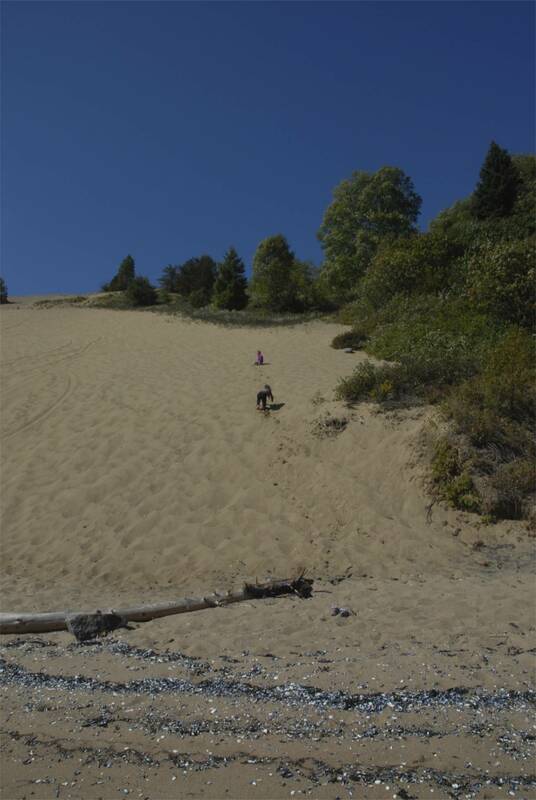 When the girls realized we were coming, they raced down to the bottom of the dune to take one last crack at gathering shells, then raced all the way back to the top. The energy it would have required for me to do what they were doing was unfathomable, and I fathom these things quite a bit thanks to all this endurance racing of mine. Val and I reached the top with hearts racing and completely out of breath, and stopped to drink water. When Sylvie ran up beside me and demanded that we go get ice cream now, I immediately caved in. We drove through the town proper, laid out in tiers above a perfect harbor that must have shocked the early mariners who found it thanks to its symmetry and ideal location: immediately next to the mouth of the Saguenay and on the St. Lawrence, teeming with everything from krill diven up the river by the Atlantic tides and the blue whales that followed them, to salmon and trout and mussels and clams and mackerel and cod and herring and God knows what else. They would have been surrounded by more trees, and better and taller and straighter trees than probably many of them had seen in generations in the old world, and from those trees deer and moose would have been staring out at them, more protein from game than they could fathom. Beavers would have been littering the place, with their impossibly warm coats. And, thanks to the rich soil, corn and greens and vines and apples would have grown quickly and abundantly. And just when the bounty of this paradise would have seemed impossible in its gift, winter would have come, and it would take it all away and make their lives harder and more fragile than they could have imagined. It’s easy to understand, in this context, the pride of these people, these tough old habitants who fought the land and came to an uneasy truce with it. We found our ice cream, located next to the whale research center and museum, and in we went. It was an extremely well organized exhibit, compact and completely accessible, and staffed with mercifully bilingual people eager enough to share their knowledge of these extraordinary mammals. Val and I may have enjoyed the exhibit more than the girls, though they did a little more coloring than we did. After a very difficult operation extracting Sylvie from the gift shop (to be fair, at this point in the day she had done several thousand vertical feet of sprinting, in sand no less), we were back in the truck and heading toward Sacre Couer where we wanted to resupply for dinner which would be, by request, mashed potatoes. We have been eating white potatoes gown in the Gaspe for the past week, and again, it is hard to convey how good this obsequious little tuber can be, but when it is right out of the dirt from the peninsula it is terrific. Placating the girls with chocolate milk, we set about making dinner and boiling the potatoes over the fire in Sally (for once, Sylvie is not responsible for christening an inanimate object, as it was Val who began referring to our fire engine red cast iron dutch oven as Sally: her line of thought, which struck me in its brilliance, was that I had been uncreatively calling the thing The Tomato, and Val had remembered the scene in Breakfast at Tiffany’s where Holly Golightly goes to Sing Sing to give “the weather report” to an old mobster called Sally Tomato… hence, Sally). 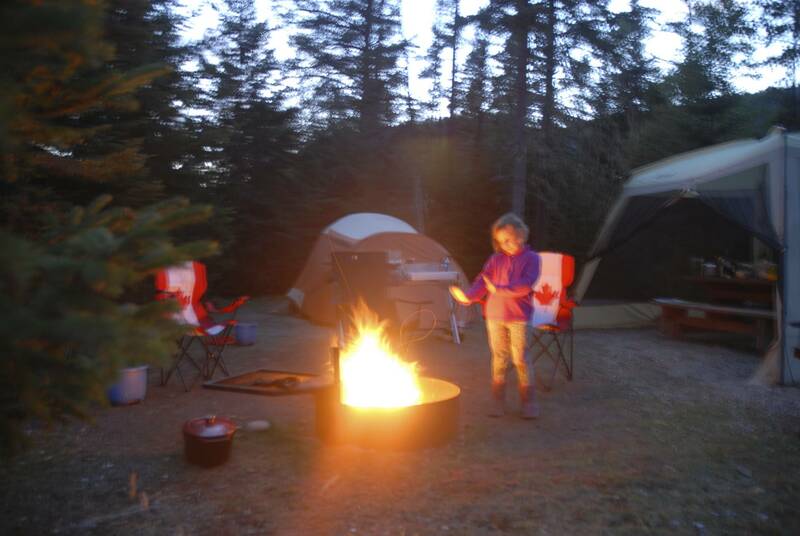 We ate huge, satisfying plates of mashed potatoes and Val and I poured each other generous jam-jars full of wine and sat about the fire watching the stars while the girls crept off to the tent to play with their stuffed wolves. With bellies full of potatoes, and wine, and chased into bed by fatigue, all four of us drifted off to sleep in, I imagine, a state quite similar as the people who set upon this place four hundred years ago, our minds full of wonder at everything the land has to offer us here.